As we're approaching the end of the year I started thinking about the products I've really enjoyed using this year and as I was thinking about it I thought I might as well post about it. I've now hit my first full year of blogging and although I haven't tried that many products, I've definitely tried a lot more than I would have done if I hadn't started blogging. This year has been the year that I've discovered several brands that have now become firm favourites. One of these would definitely have to be Soap & Glory. After trying a travel sized version of Hand Food that I received in a goody bag I appear to have launched a one woman mission to try every one of their products! 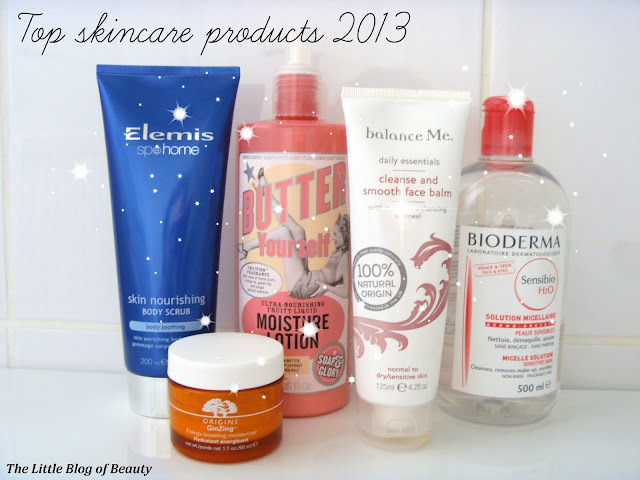 So these are my top products that I've tried in 2013. Back in July I requested a sample of this from Boots and I loved it so much my boyfriend took me out and treated me to the full size version (isn't he sweet!). I loved using this in the morning in the summer when it was really hot and humid. This is a gel-cream type moisturiser that has an amazing refreshing, cooling and soothing effect with a lovely citrus scent. This provides a great base for your foundation primer and makeup, which I think makes it perfect for use in the morning. I thought when the cold weather set in and my skin started to dry out that I would need to switch to a richer moisturiser in the morning, but I'm actually still using this now and for the morning at least this is enough, despite my dry skin. This is a very recent addition to my skincare collection that I won as part of a mystery prize giveaway for Kat's blog birthday over on Tales of a Pale Face. I only posted a review of this at the beginning of December so I won't say too much here but I love how amazing my skin feels after using this. Not only does this leave my skin perfectly scrubbed but also, as the name suggests, it leaves my skin feeling really nourished. This one is even more of a recent addition to my skincare collection than the Elemis scrub as this was part of the Yule Monty giftset that I treated myself to just a couple of weeks ago. I'm quite picky about my body lotion and usually stick to my favourite Garnier 7 day Intensive, however I think this may have now become my new favourite. I'm sure I'll be blogging about this in the new year so I'll just say here that I love this. The tube in the picture above is actually empty as this ran out a few days ago, but I kept hold of it to take the picture. I love this stuff! I don't think my skin has ever felt as smooth as the first time I used this and I don't think my skin has ever looked as good as it has since I've been using this. I haven't bought another one to replace this one, as I'm sure I have other products lurking around that I really should use up, but I'm definitely going to miss using this every night and I'm sure I'll be picking another one of these up very soon. At the beginning of this year I had absolutely no idea what a micellar water was and what it would be used for. Obviously I'd heard bloggers rave about Bioderma, but back then I was new to blogging and new to skincare (despite being in my early 30's!) but I hadn't thought about trying it myself. Then I saw Escentuals looking for bloggers to take part in the Micellar Blind Trial and I thought it might be the perfect opportunity for me to step into the world of micellar waters. Bioderma wasn't actually my winner in the blind trial (Caudalie's make-up remover cleansing water was my winner) but when Bioderma went on offer on Escentuals.com I thought I'd grab a big 500ml bottle so I could try it out properly (Bioderma is currently on sale on Escentuals.com right now so if you'd like to give it a try get yourself over there!). I love that this removes my makeup quickly and easily (including the notoriously pesky They're Real mascara) and that it doesn't dry my skin out but leaves it soft. So these are my top skincare products of 2013. Have any of your favourites made it into my top 5? Ughh, Bioderma and Balance Me are two brands I really wish I could get my hands on at Sehpora. But I'm trying to order them online now.